I have a confession: I hate (HATE!) my long runs. There, I said it. Is there some kind of would-be marathoner prison cell for people like me? I dread them all week, spend the night before coming up with a dozen excuses for why running 16 miles (this week’s long run) is insane and wrong and I should not do it. I whimper, cajole and eventually stall until I end up doing my long runs in the hot noon-time sun because I sat around making excuses all morning while I should have been running and getting it over with. Do people actually LIKE running this much? If so, I have to assume they are either insane or that they have a much higher pain threshold than I. My whole body aches, quakes and shakes by the last couple miles. I push the limit of my physical capability with each step past last week’s distance. I go through a bevy of emotions—confidence and excitement give way to anger and fury, which eventually releases some latent sorrow teeming beneath my calm (ha!) exterior. My last two long runs have been completed with tears I am too tired to even acknowledge. But I will persevere. It is an absolutely brutal undertaking, to be sure, but really it is the best kind. In the end, I will finally get to say I did it. I might not meet my time goal, but I will meet my distance goal, of that I am sure. I always said there was a reason I chose to labor naturally, without pain relief of any kind. And now I know what it is. Sometimes when the running is unbearable, when my feet feel dead, my shoulders are burning and my mouth is cotton-dry, I remember how I felt in transition (the last part of labor when the cervix dilates from 8-10 centimeters)—the leg shaking, nausea and abject terror that I was about to push a human being out of something that was small enough to hold a tampon in place. 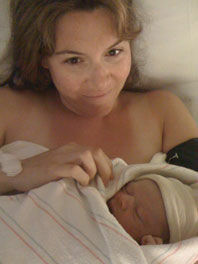 “You will feel like you can’t do it,” my midwife told me a week before my first labor. And then I did. I pushed my kids out, no drugs. I did what I thought I could not, both times. So, I know I can do this, too even when I think I can’t. Even when it seems impossible, I know this: I am hitting the marathon transition—the time where manageable 10 miles runs give way to 16-mile feats of endurance, where my body is pressed to its max and emotion is spilling out every crevice. But I have been here—at my personal edge, replete with tears and pain--before. And I pushed my babies out, just like my midwife said I would. I can, I can, I can. And I will. 26.2 miles will hurt, but I know I can push through the pain and deliver something totally worth it. Sasha Brown-Worsham is a writer, a mother and an unabashed, unashamed runaholic. She's pictured here with the product of her last major feat of endurance and pain.Check her progress each week as she trains to qualify for the Boston Marathon.